This walled and gated villa is a must to see. 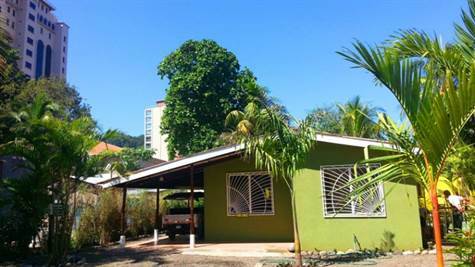 It is a large 2 bedrooms, 1 bath house that has just been totally remodeled. It is fully furnished and ready to move into. Everything inside is new including granite counter-tops, 3 A/C units, electric- instantaneous water heater, stainless appliances, new windows, all new electric, all new plumbing and new septic system, plus so much more. This secure private property is 6200 sq feet and is right next door to the new Croc's Cacino /Resort. This neighborhood is very upscale, safe and secure. The tropical palms and flowers are absolutely beautiful. Parking for 6 cars within compound. There is enough room in rear to build up to 8 cabanas or add a pool. The property is a 2 minutes walk to the beach. No condo fees and taxes are only $450. per year. The house has been very well insulated so utilities are very low. Just reduce to $249,000.